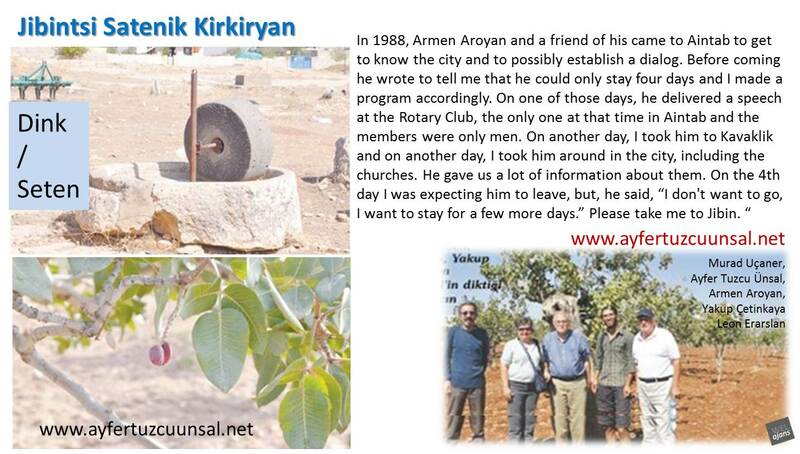 In 1988, Armen Aroyan and a friend of his came to Aintab to get to know the city and to possibly establish a dialog. Before coming he wrote to tell me that he could only stay four days and I made a program accordingly. I said, “Oh my God, what is Jibin and where is it?” I heard this name for the first time my life. Armen, a driver, and I went to the bus station to see Kadir Maz. He invited someone from Jibin to his office. That gentleman explained to our driver how to get there. The following day, at an early hour, we set off for Jibin. The name is changed to Saylakkaya. The first thing we learned was this. You pass Birecik Bridge and make a left turn and you go to Jibin, which is a village of Halfeti. You will see the photographs give you an impression of a moor. In the middle of the village there are many cisterns made up of rock. Today, the cisterns are filled with small rocks in order to prevent any children falling into it them. When I went there in 1988, there was water still in those cisterns. At that time we were welcomed by Kel Muslim to his house. He was a very nice person. He really welcomed us very well. While we were sitting in his house, many villagers came to his house because they said that the son of Arogil was here. Some villagers were touching Armen; some villagers were asking him their relative’s names and if he knew them. All the Jibinstsis came to Muslim Bey’s house and wanted to take to Armen and there is a story behind this. to go back to Egypt and he stayed in Aintab to die. All this happened before 1915. In 1915 when the Ottoman government decided to deport the Armenian families, the Jibintsi Armenians decided not take their daughters to an unknown and dangerous desert. At that time they had good relationships with the Moslem families in the village. Approximately 30 Armenian young girls were left behind. They were raised by the Moslem families and they were married to their sons. So, many Jibintsis had Armenian mothers. Of course, all these Armenians girls were converted to Moslem and they took Turkish names. In Jibin, to have an Armenian mother is nothing to be ashamed of and nothing to gossip about. In this particular village the crossbreeds are beautiful. When I think of a Jibintsi I always think of some blond woman or man with beautiful green or blue eyes. 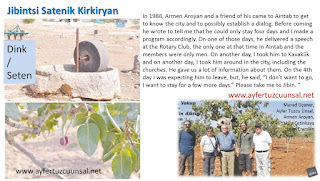 Armen Aroyans’s father visited Jibin when he was a baby. I had the opportunity to visit him in America and Father Aroyan reminded me, with his eyes and his looks, of a typical Jibintsi (blond and green eyed). In June of 1988, we also went to house of Satenig Kirkiryan whose name was Hanim in her Turkish ID. Satenig, at that time, was 88 years old and had henna in her hair. She was very talkative. She had a very strong memory and she was such a sweet, nice woman. The people around her told her that the son of Arogil came to the village and wanted to see her. Before talking to Armen, she made him sit next to her. She held his arm and said, “Your grandfather was my teacher. Do you know what he told me?” She started telling the verses from the 23rd Psalm. During this time Armen was driven to tears and he was crying uncontrollably. The conversation went on for some time and then Nuri Güngören came into the room. Nuri’s mother was also one of the Armenian girls left behind. He was blind and had gone to the blind school in both Aleppo and Beirut with the help of his Armenian uncle. He learned Armenian but he never spoke it. 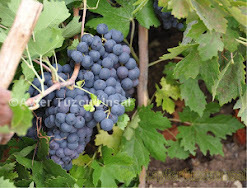 Armen's arrival to Jibin made him remember and he started to speak Armenian. He was also singing Armenian songs and Armen was so touched and insisted that Nuri sing other songs and speak to him in Armenian. On the other side, I found myself in a cultural shock that I had never realized before and I was observing everything with a keen interest and I was trying recall everything in my memory. Satenig. I wondered if her grandchildren or great grandchildren were beautiful like her and were they clever like her. The next time I will write about the Jibintsi daughters who all went to school, and even though there is a shortage of water, this village is very clean. Jibin is different than the other villages that I have visited before. So I will talk about this.